"Stay" was one of the first commands I taught Rocco. Not only is it one of the basic skills for good pup manners, it comes in handy in so many situations. The very best reason to teach your dog to stay is to help keep him out of harms way, but there are other practical reason too! Here are our top six reasons and situations for "stay"
Safety at home - teach a sit/stay or down/stay at the front door. A good, reliable stay can help keep your pup from bolting out the door when the delivery man comes by. Safety on the road - if your dog rides in a crate or a car seat, teaching them to stay until you have them securely leashed will keep them safely under control as you exit the car. Posing for photos -- a reliable stay will allow you to take adorable photos of your dog in all sorts of settings! Pausing while on walks -- whether at a crosswalk or stopping to talk to a friend, a dog in a sit/stay will wait patiently until YOU say it's time to go. Training for performance sports -- a start-line stay is a crucial skill for any agility dog. Waiting for dinner -- I put Rocco in a down/stay before every meal. Not only does it keep him from jumping up but it also reinforces his stay every day. Even after your dog has learned important commands like stay, you can't reinforce them too much! Here's a great video from Pet 360 where dog trainer Victoria Schade shows how to reinforce "stay" even when there are distractions. 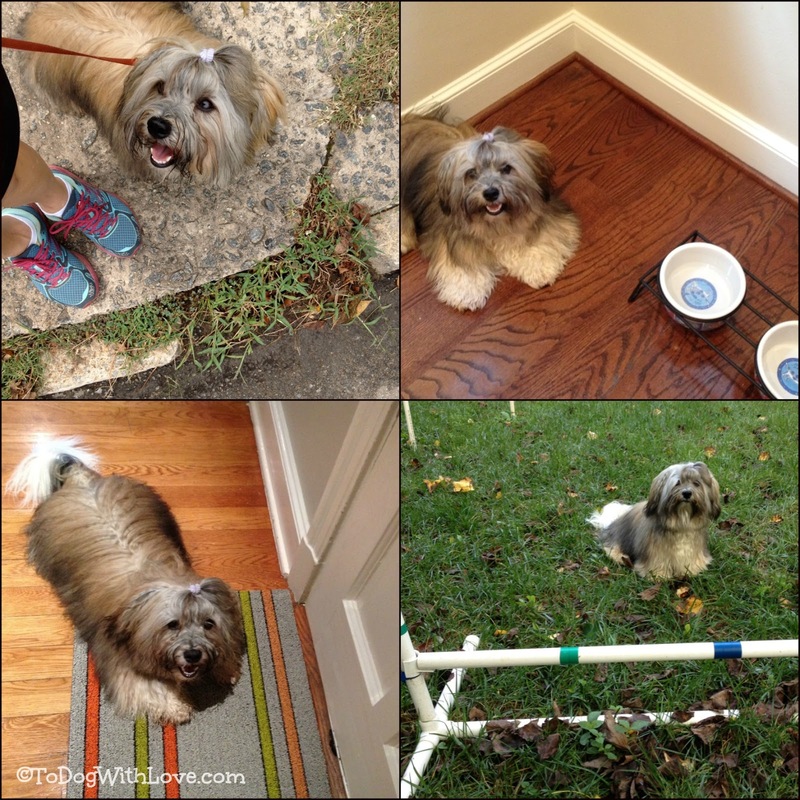 When do you ask your dog to stay? Ditto we agree. Have a terrific Tuesday. Good tips. I think Mom and I need to practice more Stays. I do short stays but she thinks that I need to do longer Stays. We're gonna work on dat. We do pretty well with stay, unless a wabbit or squirrel is cruising by, then I will hear nothing and do as I please. But for the most part my sister and I are well behaved. It is true, though, that we do need to keep working on our commands and they are all important. Good post! Great tips! I am working on Shiner's stay right now. Especially during feeding time. The car "stay" is super important, especially for traveling dogs! Great post. All excellent reasons. Pierson is good at all six situations. Maya is good for most of them, but she gets super-excited when the delivery man or someone else comes over. The Cookie Diet seemingly have high-protein as its schedule too. They contain harmful preservatives and lot of salt. He take a weekend nap maybe monthly and typically sleeps about 6 hours a night.